Join us on Sunday, May 21, 2017 from 12 – 4 PM for our May Long Open House & BBQ and spend some time at the lake for the long weekend! Stop by the clubhouse to chat with us and Fred Trommeshauser. Ecko Marine will be there with with boats, Sea-Doo’s, and giveaways for the kids! Enjoy some BBQ lunch, tour through the Show Homes, and explore the community including all our amenities. This weekend also marks the opening of the pool for the season! What Show Homes Can You See? #520: Fully finished 3 bedroom, 2.5 bath bi-level. This home has gorgeous white cabinetry, granite kitchen countertops, and a great view of the lake! #541: Fully finished 1472 sq ft bungalow with 4 bedrooms and 3 baths. The open concept kitchen, dining, and living space features a high vaulted ceiling that leads out onto the large covered deck. Granite, hardwood, and stainless are just some of the amazing interior finishes. #542: Fully finished 4 bedroom, 3 bath walkout bungalow with 10 ft ceilings, granite, hardwood, a basement bar, and one of the best panoramic views of the lake! #544: Walkout bungalow with 2 bedrooms and 2 baths. This beachy-feel home has an unfinished basement that creates an opportunity to customize the space that leads to your outdoor retreat. #607: May long weekend will be the grand reveal of our brand new fully finished bi-level! It features a triple attached garage, huge master suite with amazing lake views, contemporary grey cabinetry and hardwood floors. What Amenities Do We Have On-Site? What is Unique About The Estates at Waters Edge? 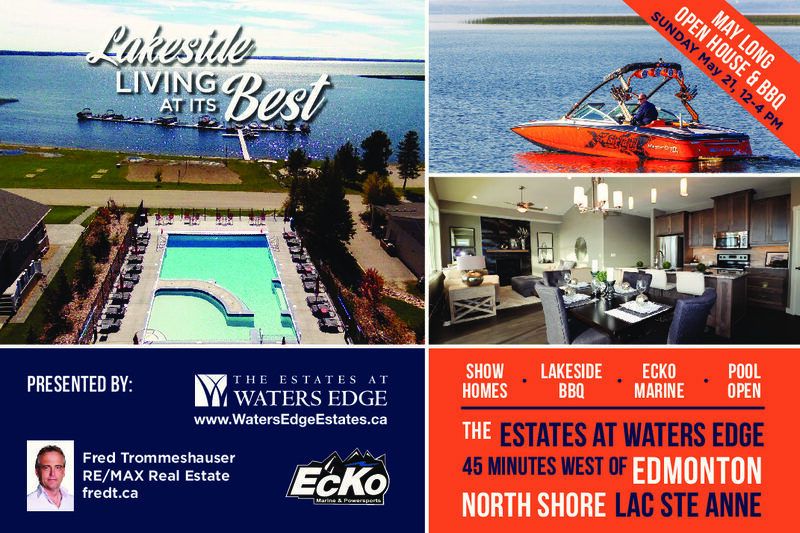 Waters Edge is a gated (not age restricted) community that offers resort-style living only 45 minutes west of Edmonton on Lac Ste Anne. Have it as your full-time residence or you can use it for summer getaways. 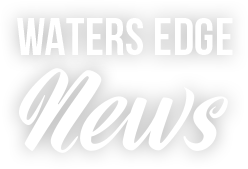 Waters Edge is family owned and operated. Founder, Rick Arndt, is a registered architect who has been involved in many projects. We take great care of the property from the construction process to landscaping to maintaining the common amenities. We offer craftsman inspired, customizable home designs on our lakeview or lakefront lots that are competitively priced. The price of our spec homes include GST, appliances, landscaping, and a 10 year progressive warranty.  When building a custom home, our Builder and Development Manager work closely with you during the whole construction process to ensure a smooth and pleasing experience. We also have an interior decorator who will help you choose all your interior finishes! We hope to see you at our May Long Open House & BBQ on May 21 from 12 – 4 PM!